SOLDERING IRON - Basic tools for electronic projects. The connecting lead of each component must be soldered into place on the printed circuit board. A specialized soldering iron must be used — one that is neither too big nor too powerful to harm either the component or the circuit board. This is a simple electronic project of automatic shutoff battery charger. 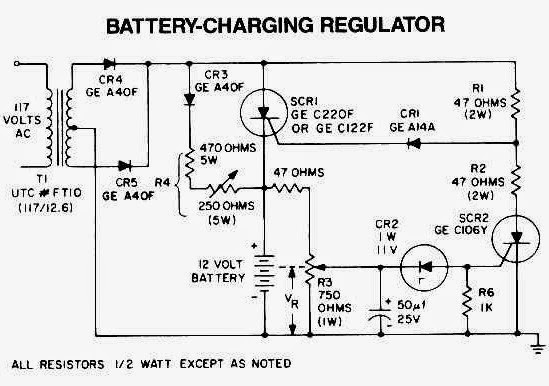 Adjust this circuit by setting the 500-ohm resistor while it is attached to a fully charged battery. The circuit is capable of charging a 12-v battery up to six ampere rate.